South African pastor and author Andrew Murray, (1828-1917), one of four children was raised in the most remote corner of the world - Graaff-Reinet (near the Cape), South Africa, It was here, after his formal education in Scotland and three years of theological study,in Holland, that Andrew Murray returned as a missionary and minister. Murray's first appointment was to a remote and unattractive territory of nearly 50,000 square miles and 12,000 people. In 1873, he helped to establish the Huguenot Seminary for girls. He also served as the first president of the Young Men's Christian Fellowship (YMCA). 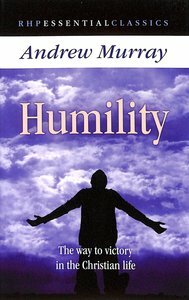 Not only was Andrew Murray the author of over 240 books, he was also a man of great prayer. He began writing on the "deeper Christian life" - a favorite subject for Murray - for his congregation as an extension of his local pastoral work, but he became internationally known for his books, such as With Christ in the School of Prayerand Abide in Christ, that searched men's hearts and brought them into a deep relationship with Christ. Writing with an intensity of purpose and zeal for the message of the Gospel, Murray wrote numerous books even after his retirement at age seventy-eight. .- Publisher.